I'm extremely fortunate to have some gorgeous photos of a sewing booth full of beautiful quilted wall hangings, towels, placemats, table runners, and pretty storage boxes to share. 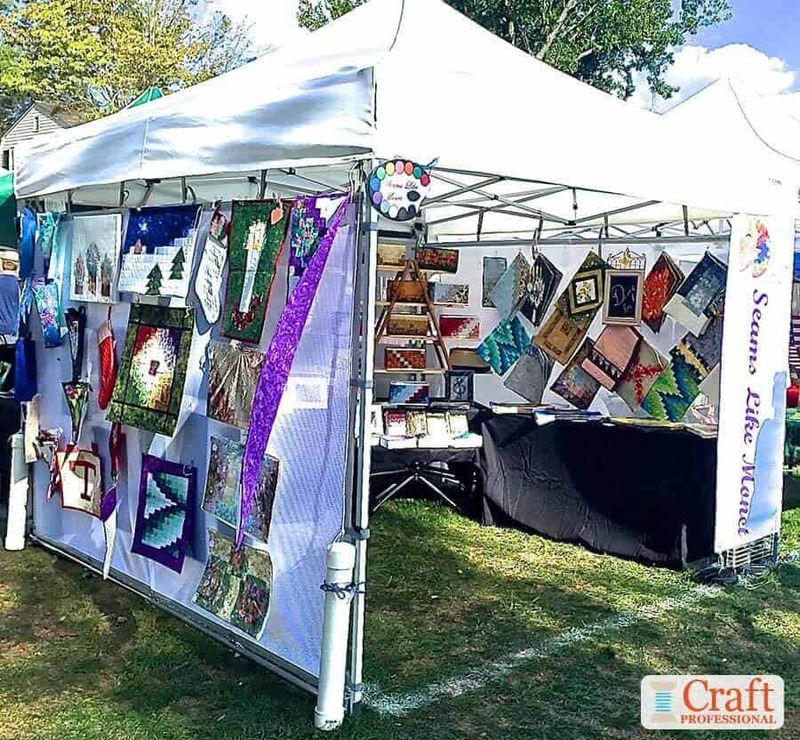 Theresa, the owner of Seams Like Monet, (I love her clever business name) emailed me recently, and we had an interesting conversation about how tough it can be to get photos of certain types of craft booths. For example, I have plenty of jewelry booth photos on the site, but it can take some time to get a good collection of certain other types of booth pictures. Any jewelry artist will tell you craft shows are typically full of jewelry. It's one of the most competitive categories at shows. Lots of jewelry designers at shows means lots of opportunities to get jewelry booth photos. 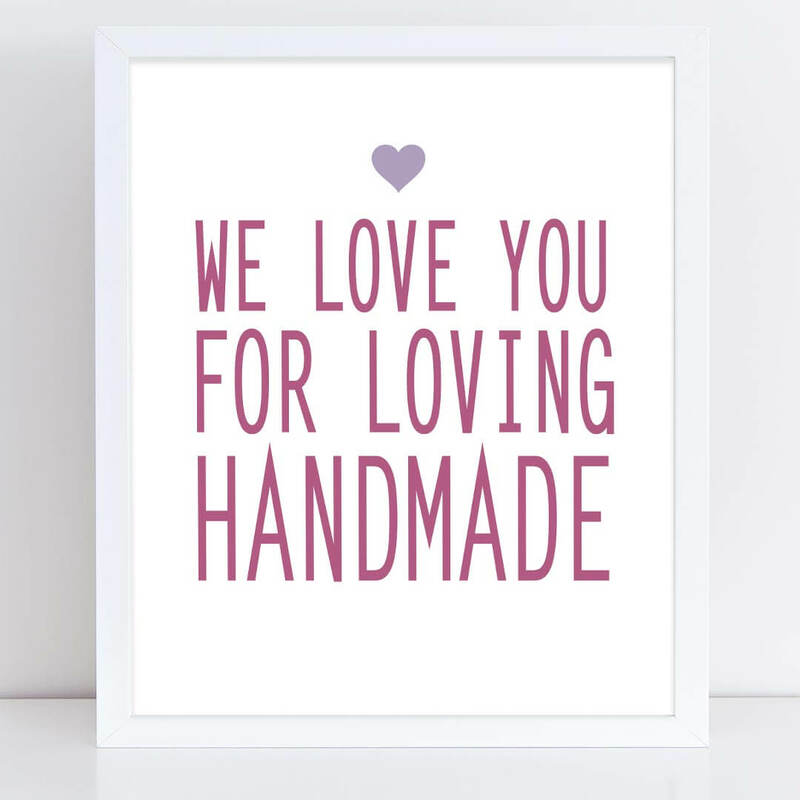 But it also means there are other types of craft fair displays that aren't as well represented on my site as I'd like. 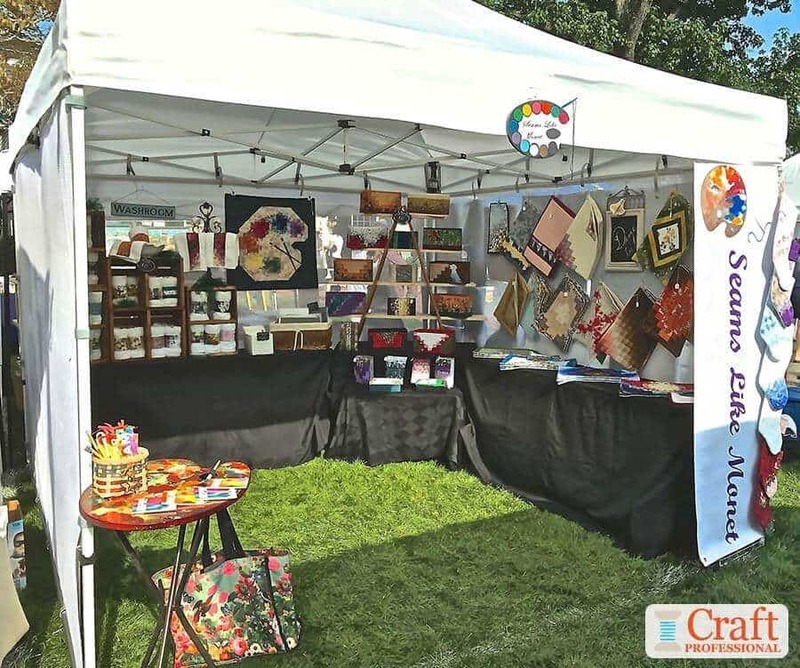 That's why I was immensely grateful when Theresa generously shared some photos of her fantastic sewing booth as well as a detailed description of how she displays her products at craft shows. Let's dive in and check out Theresa's wonderful display! Check Out This Sensational Sewing Booth! This first photo below shows an excellent overall view of the booth. 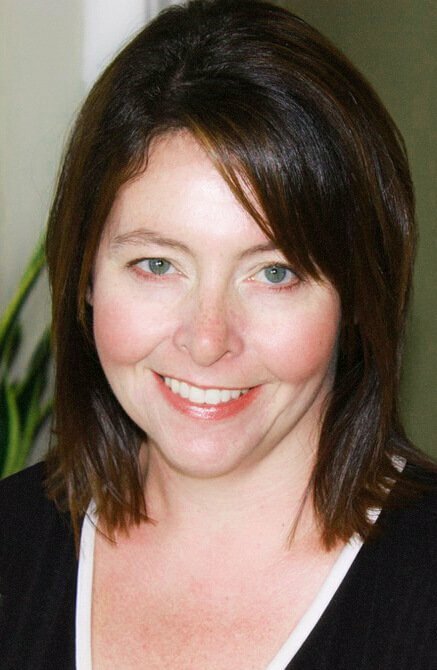 Theresa writes "My business is Seams Like Monet and my logo is a painter's pallet with a needle & thread instead of a paint brush. 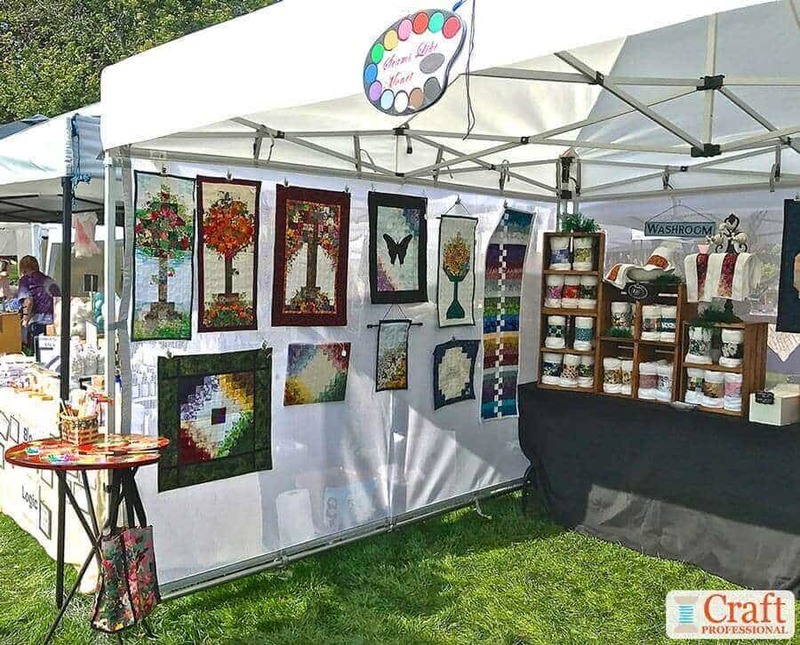 As you can see I have the logo displayed several times (over the entrance, on a banner to the side of the entrance and also on a display piece at the back of the tent)...I make quilted wall hangings, towels, placemats, runners, and decorative storage boxes." Theresa uses a ladder-style stand that provides plenty of display space. You can see it in the photo above. She says, "In the right corner is a display that my husband built. It's an A frame piece with boards for shelves running through it. (It collapses for easy portability.) This is where I feature my decorative storage boxes along with a copy of an insert that I include with each box sold. It explains all sorts of possibilities for how the boxes can be used. (They collapse for convenience!)" The right side of the booth (still looking at the photo above) is dedicated to displaying placemats. "On the right is a table where I display placemats. On the wall over that are more with a sign that says "Dine In". This way people don't have to dig through a box of a bunch of placemats. They can see them easily. The picture doesn't show it but I bought a wind chime made out of silver spoons from another vendor and I now hang it over the display." The tables are half size to create more room in the tent and accommodate more people at a time inside the booth. Theresa's display makes great use of the 10 x 10 space by using mesh display walls to take advantage of the full height of the space. The booth is full, but thanks to the use of narrow tables, there's still plenty of room for customers to comfortably come in and browse. In the photo below, you'll see, on the right, a display of colorful towels. Theresa says, "My towels are rolled so the quilted trim shows and they are displayed in stacked crates. I also have one set hanging from an iron stand with a porcelain spigot and knobs along with a set displayed in a porcelain bowl like you'd see on a wash stand. This way people can see the size of the towels and handle one. Note the "washroom" sign over the display. The area is punched up with air ferns for softness." I love the way Theresa has found a way to encourage customers to touch her towels while still keeping her display tidy. The towels hung from the iron display stand help customers to imagine how her gorgeous towels would look brightening up their own homes. "Finally," writes Theresa, "notice the table on the left of the entrance. It's also a painter's palette that I got from Hobby Lobby. The flowered bag hanging on it holds bags for my sales and also freebies that I include in the purchases. I encourage people to take an item if they wish. There are notebooks, pencils and book marks that I got from the Oriental Trader catalogue. They have watercolors printed on them and I stick my business name and logo on each one. Business cards are on the tables in a couple of places as well." Theresa uses display walls by Flourish, so she can display her quilted wall hangings inside and out if she has an end space at a show. You can see this booth setup in the photo below. Displaying items on the outside of your booth when you have an end space is a smart strategy to help draw attention to your booth from a distance and bring customers into your space. Theresa has wisely built flexibility into her sewing booth design that allows her to adjust her display to make the best use of the features of her booth space. In addition to having a beautiful and well thought out sewing booth, Theresa also has excellent help at shows. She says, "My husband and daughter help sell too. My husband is "the banker" taking credit cards and cash and my daughter helps sell and does the bagging." I'm so grateful to be able to share a fantastic booth that is both beautiful and very functional. 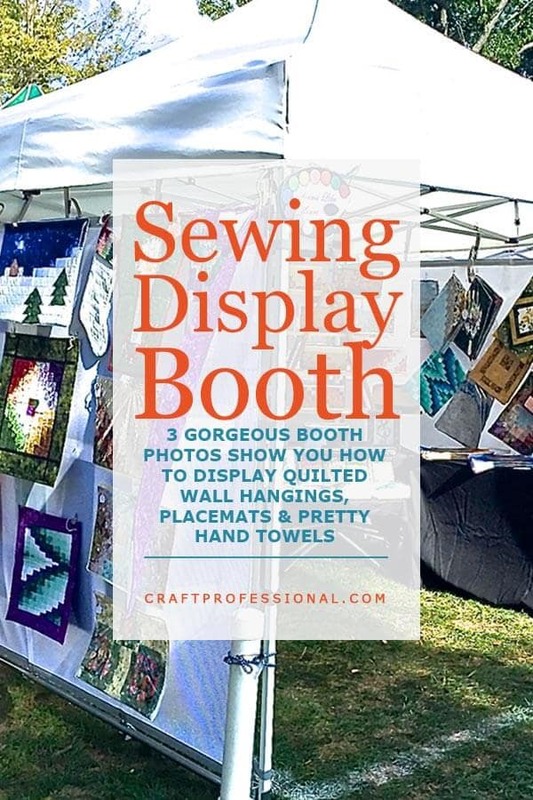 Thank you, again to Theresa from Seams Like Monet for so generously sharing her wonderful sewing booth display ideas! 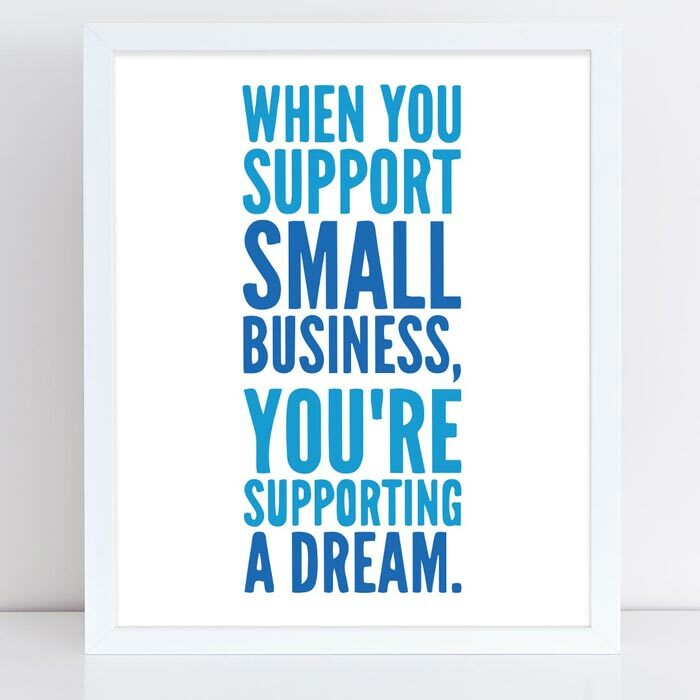 Check out my Etsy shop for printable signs you can display in your craft booth to encourage customers to shop handmade and support small business. 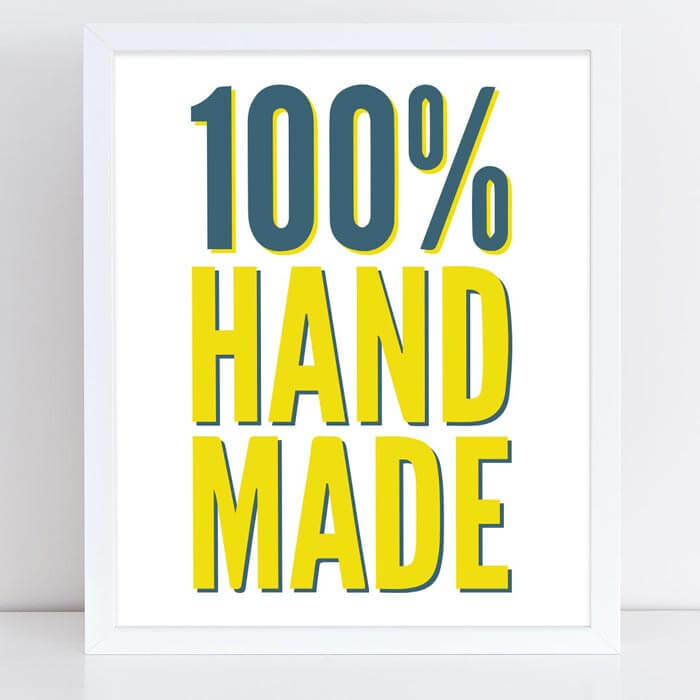 Let your customers know your work is 100% handmade.